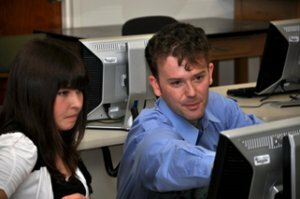 The undergraduate Bachelor of Science (BS) degree in physics features small classes, research opportunities with faculty, and great flexibility in choosing electives and planning career paths. 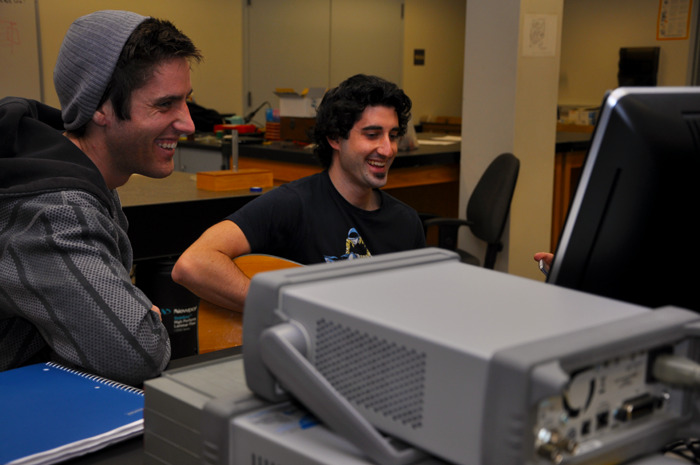 Our majors enjoy a relatively small department where faculty and staff know them personally, and where they can socialize and study together with their student colleagues in our Dan Black Center "grad room", maintained by the Physics Club. Roughly half of our majors are transfer students. We graduate around 10 students each year. Additional information can be found in the university catalog and its physics pages, but please don't hesitate to contact us to schedule a visit or meet with an advisor. Send Leigh Hargreaves, Program Coordinator, and Ionel Tifrea, Chair, an email. Note, applications for the program are completed online. For a wealth of resources on careers in physics, check out CareerCornerStone. which must include 3 units of either Advanced lab (PHYS 481) or Independent Study (PHYS 499), where the Independent Study must be for performing laboratory based research with a faculty mentor. A table showing all required/elective courses for the Physics Major, plus pre-requisites, units and typical course availability, may be downloaded here.